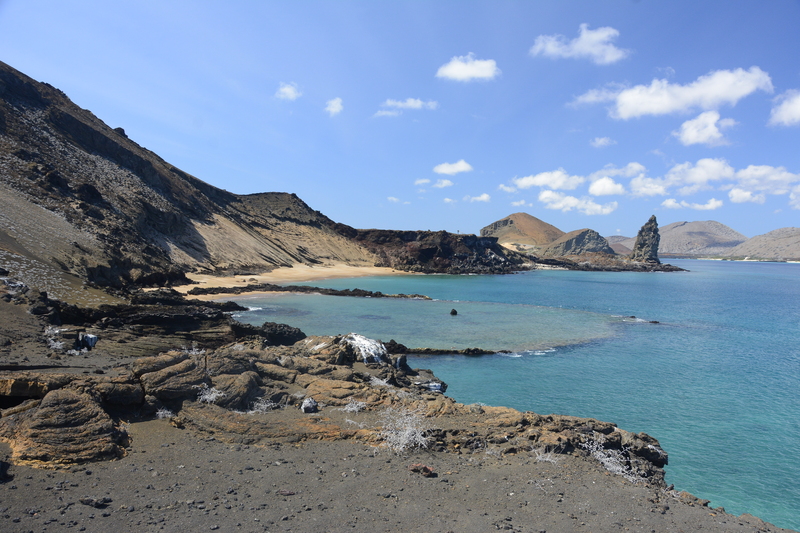 January 27, 2017 – A most amazing adventure to Bartolome Island…. It is our last full day in the islands and we’re planning to make the most of it. We had to be at the municipal pier and park at 5:50 am (yes, before sunrise!) to meet our tour so we were up pretty early. The itinerary said they served breakfast so I didn’t eat, but Kathy made sure to get her coffee before we left. We arrived first and next our captain while others straggled slowly in. Luis, our guide, checked our names on his list and informed us that the tour was only half full which meant that our boat, which could accommodate 16 guests comfortably, would be spacious for the eight of us going. I had some doubts about the trip, though, when we all loaded into a mini van that would normally hold a maximum of eight passengers in the US and we were loading in ten with the help of jump seats in all the rows. Soon we would be using the maximum number when we stopped on the way to pick up two additional passengers in the little town of Bellavista on the way to the channel. 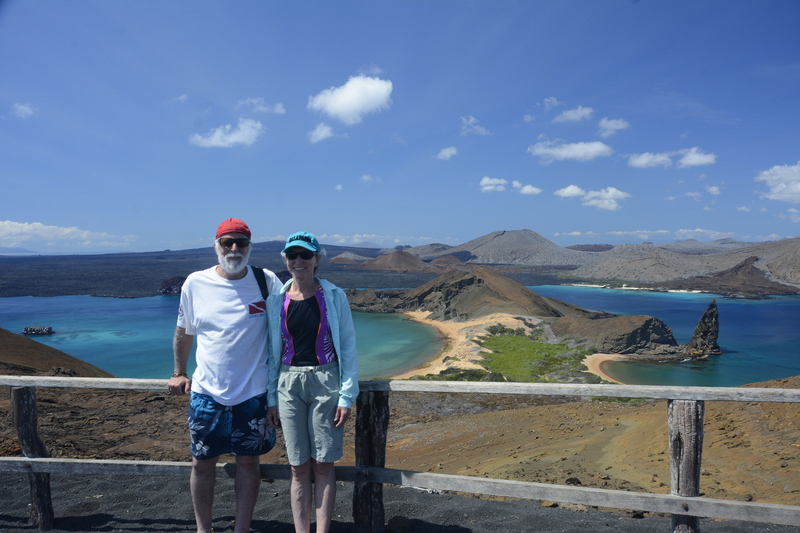 Any doubts I had about the day, though, would soon be swept away as this turned out to be our very best day in the Galapagos. As we arrived at Itabaca Channel yet again (the third day in a row for me and we’d be here again tomorrow when we head to the airport) we waited for the zodiac to meet us and shuttle us out to the boat. 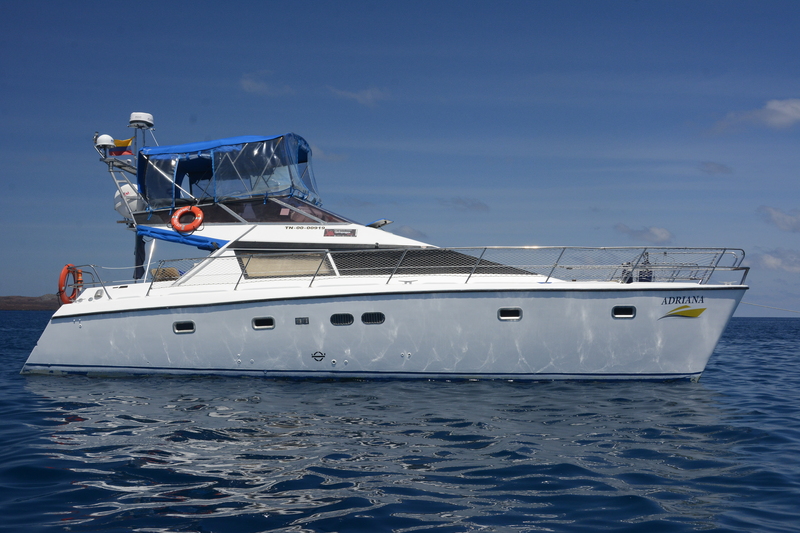 We would be sailing on the Adriana, a reasonable new catamaran that was a gorgeous boat with plenty of amenities. 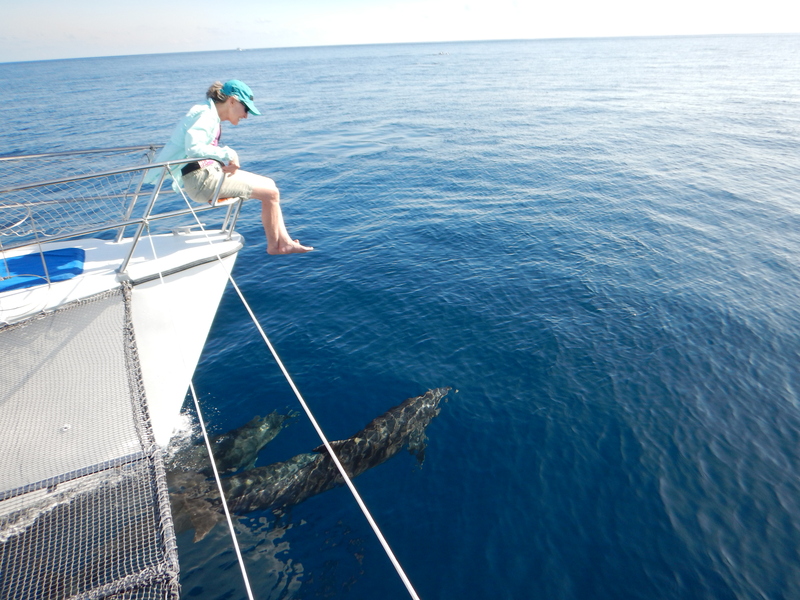 There was a seat on each bow of the twin hulls so that you could dangle your legs in the air as you traveled and I think Kathy found them two seconds after we were underway. 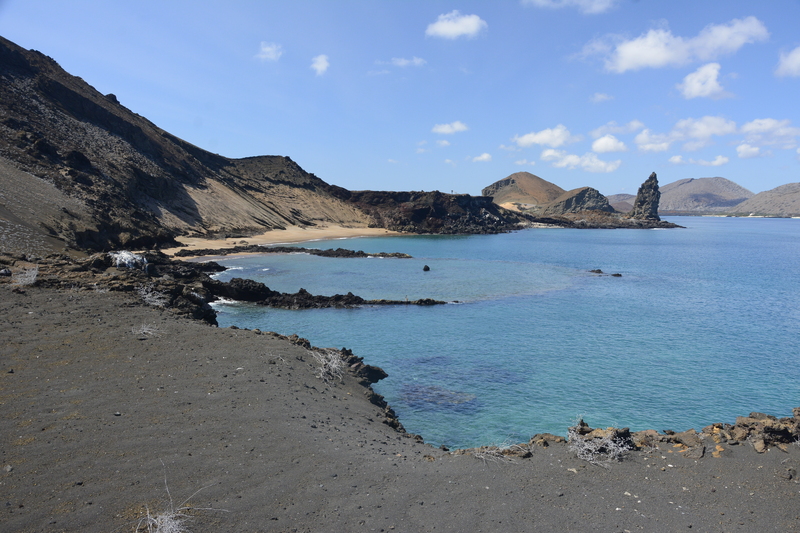 It would be a good hour and 45 minutes for us to reach Bartolome, so we had plenty of time to relax and check out the sights. And yes, breakfast, which consisted of scrambled eggs and toast, a slice of cheese and lunch meat, would be served very shortly. There was room for all of us around the main table in the galley. Had there been sixteen of us it would have been a bit more cramped so we were grateful for the slow season, though I’m sure the crew would have rather had more of us to leave tips in the end. 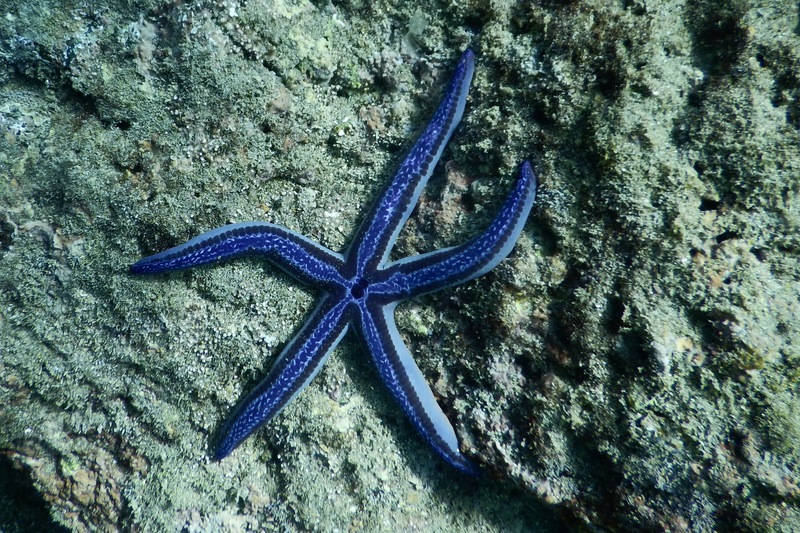 We kept our eyes peeled for any signs of deep sea creatures and about half way there, I spotted tiny black dots and splashes on surface some distance to our port side. I shouted to Luis, who happened to be captaining the ship at that moment and he swung around heading directly towards the commotion. 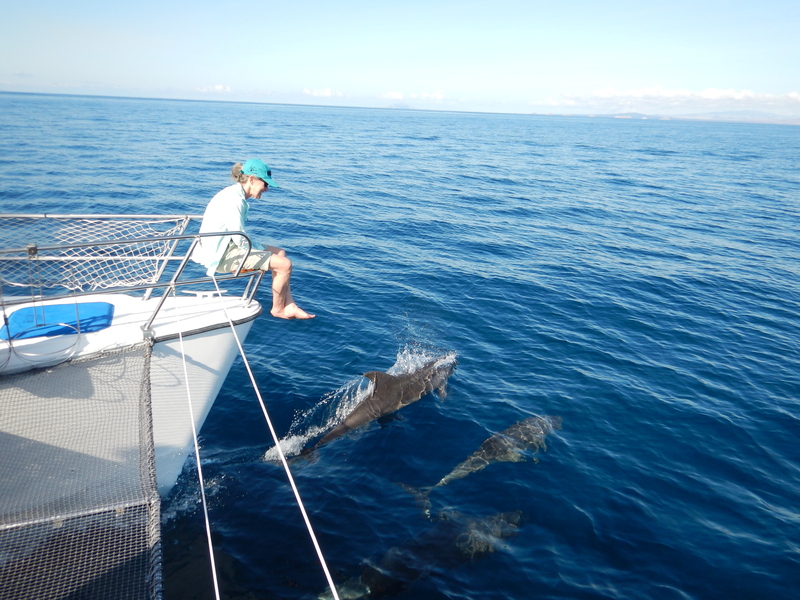 As we got closer, it became clear that we had found a pod of bottle-nose dolphins swimming and playing. Kathy was already in one of the bow seats and as we came upon the pod they all began to swim with us, jumping out of the water and showing off for us. 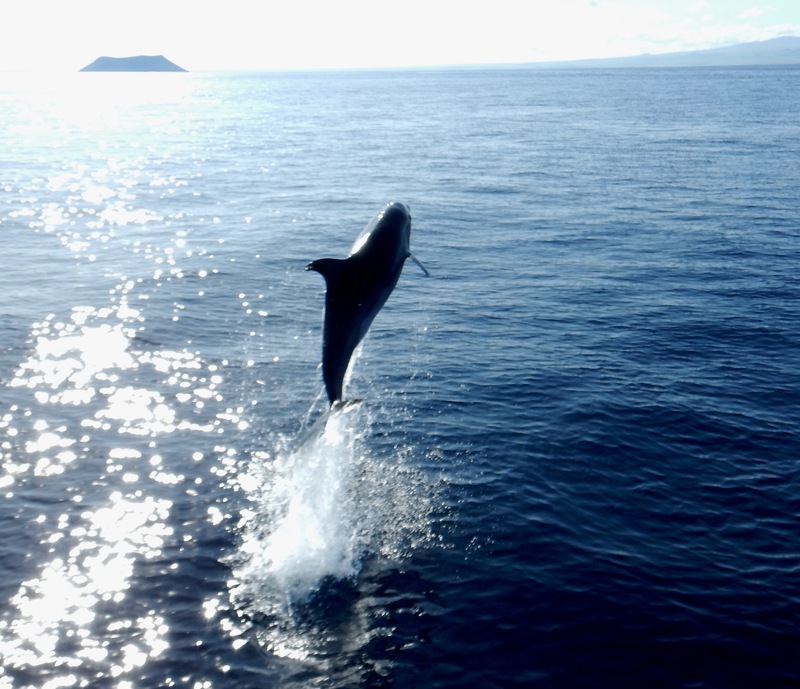 It was really a sight, but best of all, Kathy had the biggest of smiles on her face as it seemed the dolphins were putting on a show for her alone and the rest of us were merely observers to some wonderful ballet. 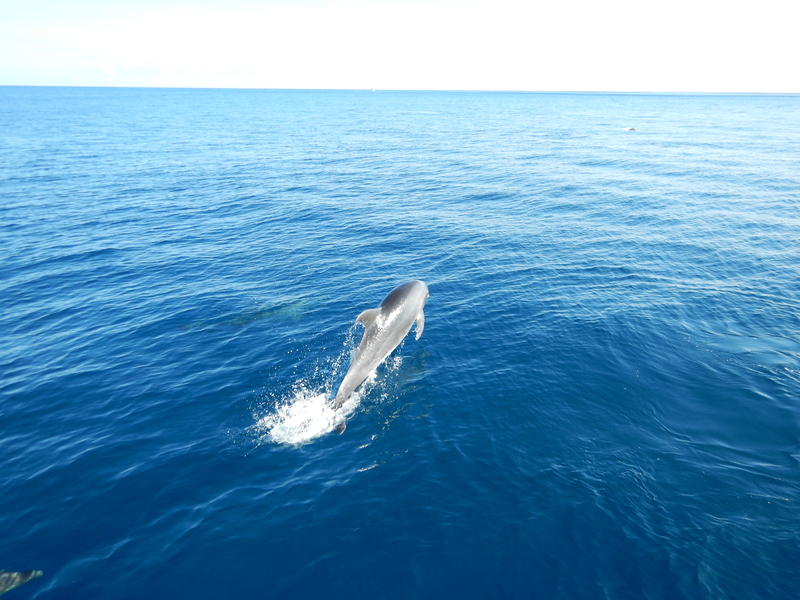 They swam with us for what seemed like forever, but I’m sure it wasn’t, and we were eventually on our way back on course for Bartolome. 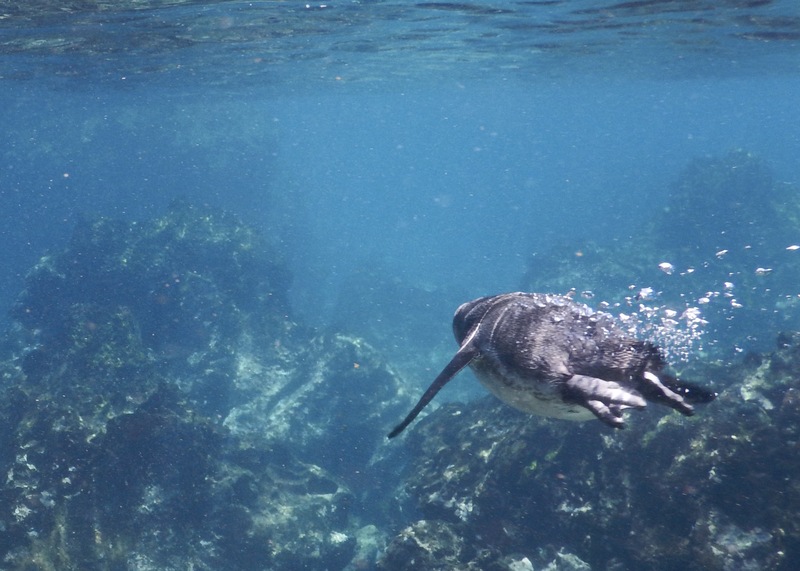 Though the memory of those dolphins will remain with all of us for a long time, I know a small piece of Kathy’s heart will remain with them in the Galapagos forever. 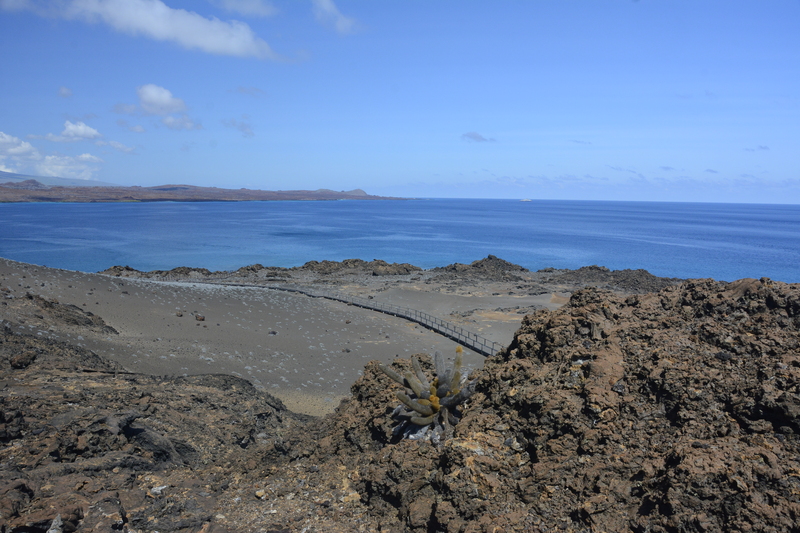 We arrived to the south side of Bartolome where I had been diving the day before and as we motored around the island and in between it and Santiago Island, it was readily clear that this archipelago had been born of fire and was still in the process growing. 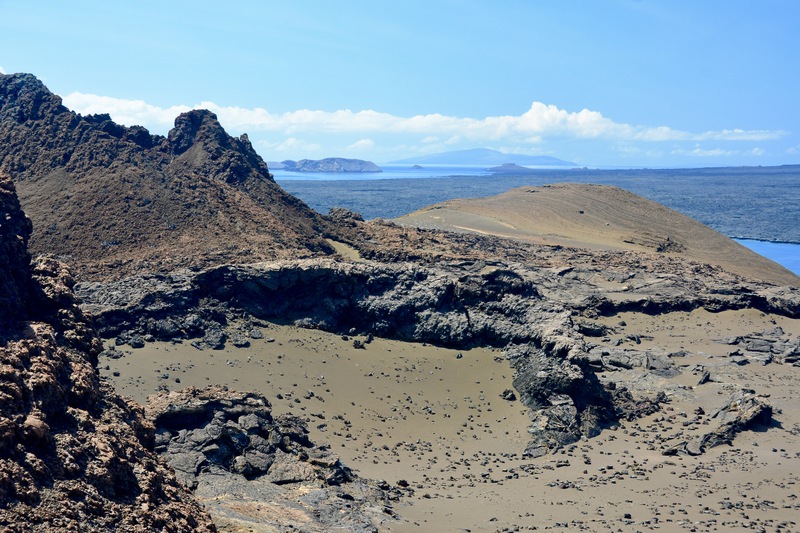 Where we were was entirely modeled by lava flows and some type of volcanic activity or another. The landscape was clearly unearthly and more suited to another planet or the moon. One could only imagine that this is what it would be like to be on Mars, though the beautiful azure ocean brought us back to reality and the fact that we were still on good old terra firma. 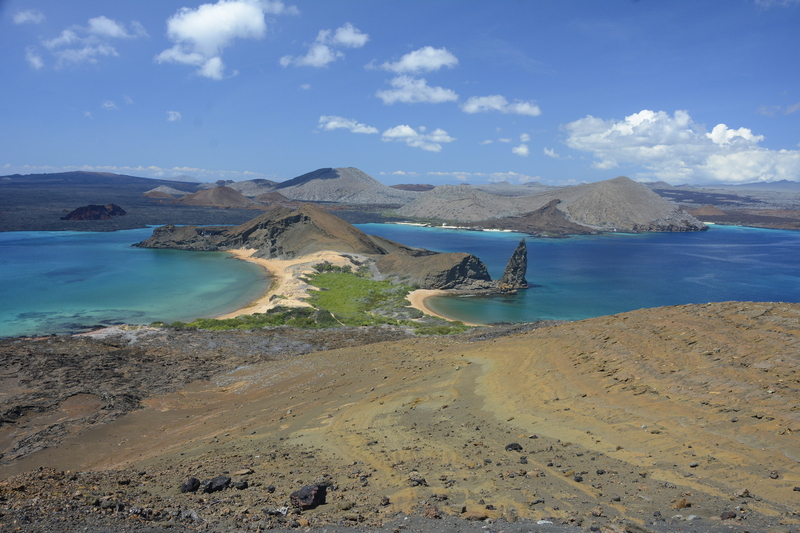 The Pinnacle, as it is called, is perhaps the single most photographed landmark in the Galapagos, and therefore, Bartolome Island is also once of the most popular places to visit. 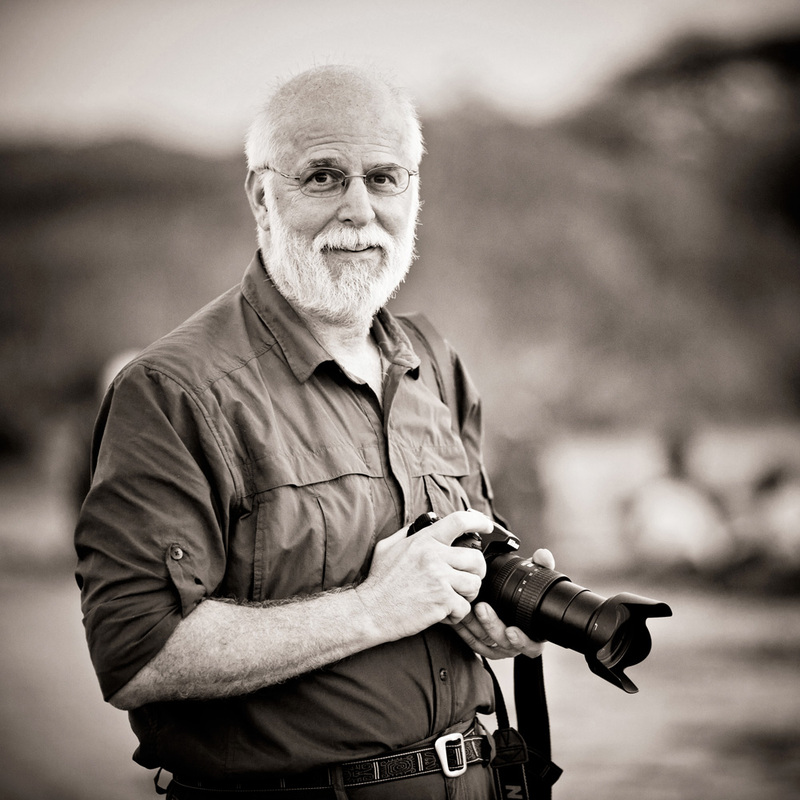 They limit the number of boats that can visit each day, though, not only to preserve the remoteness of the location, but also to reduce the amount of wear and tear on the Island for even though it appears to be mercilessly tough, it an incredibly fragile ecosystem that must be continually protected. 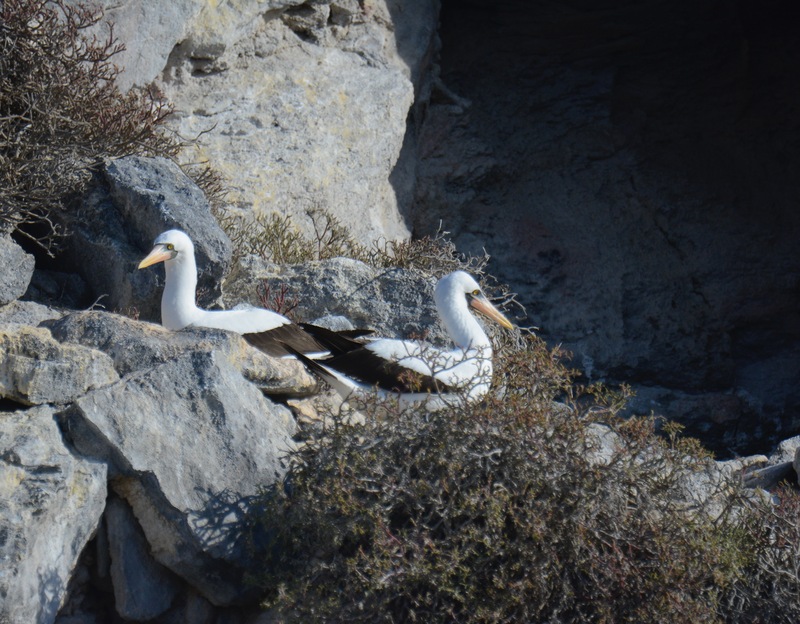 We loaded into the zodiac to go ashore and climb to the highest point on the island, which is approximately 90 meters, and which commands an incredible panorama looking across to Santiago and all the smaller islands dotting up and down its coast. 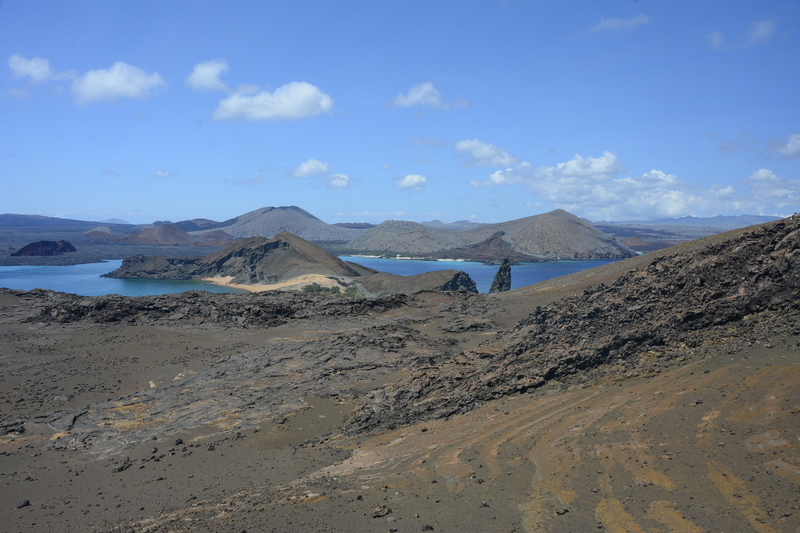 As we climbed along the wooden path to the top, Luis pointed out all the many small volcanic cones on Bartolome and larger ones across the way on San Salvador. 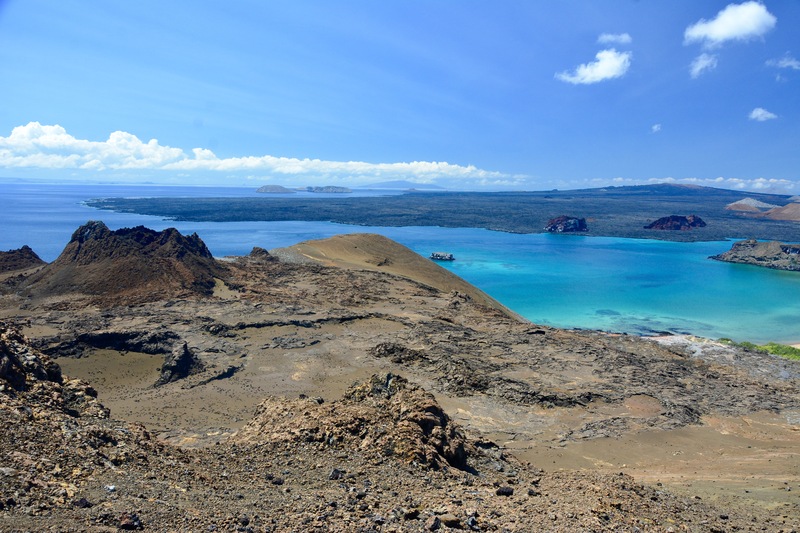 The view from the top is amazing and you could see so many of the islands that make up this unique and incredible archipelago. Very little lives on this island due to its inhospitable nature and those that do must have a very hearty aptitude. It is truly a moonscape. Catching the zodiac to head back to the Adriana you realize immediately what a rare opportunity it is to visit such a place and what it must have been like over 150 years ago when Darwin and the Beagle came upon it. It is also clear how important it is to preserve and protect these islands, for even though they have been so greatly effected by man and industry, they are still one of our closest links to our past and what makes us who we are today. 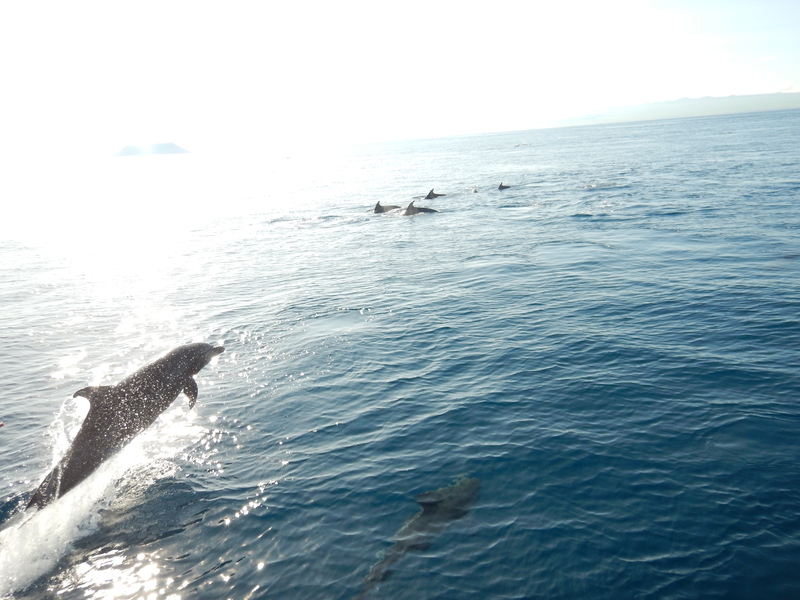 Once all were aboard the Adriana, it was time for a swim and almost everyone was up for snorkeling. 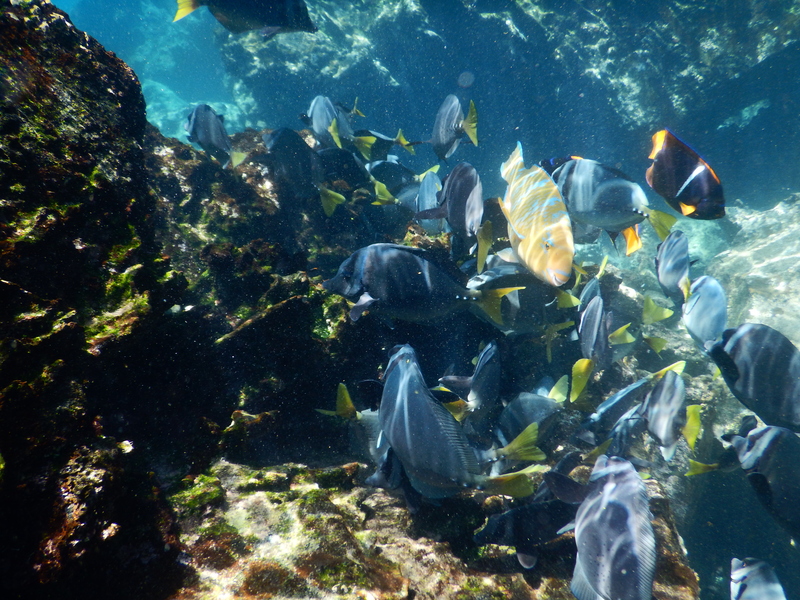 We had our own gear and Luis and the crew outfitted the others with masks, snorkels and fins. 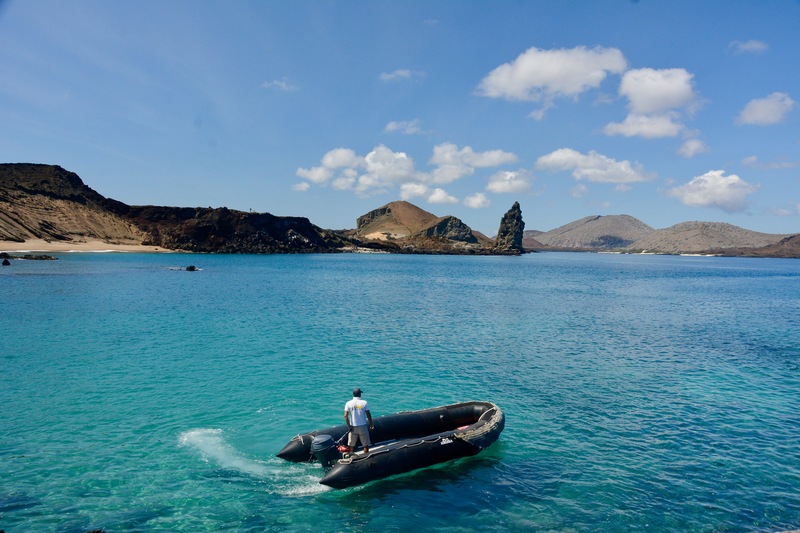 We took the zodiac around to the south side of the island and all got into the water for what we discovered were absolutely perfect conditions. 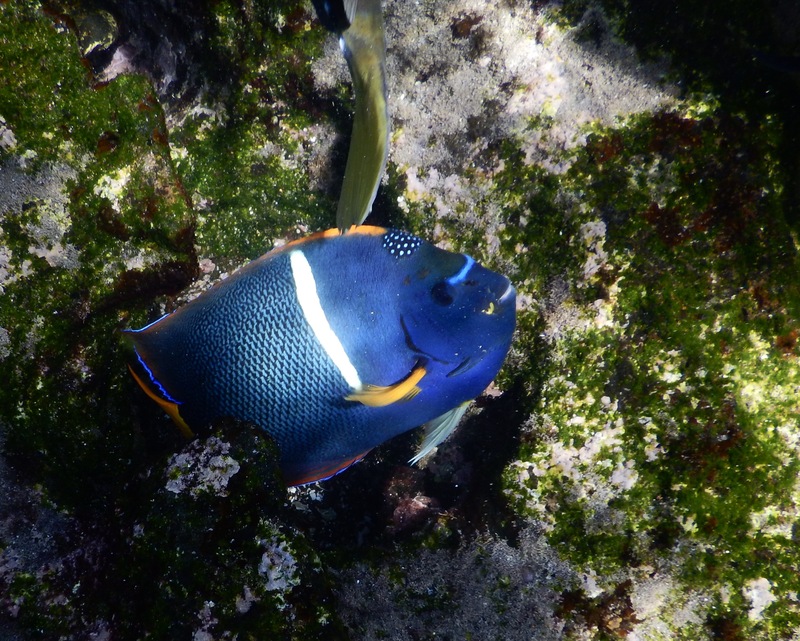 The visibility was great, the temperature was perfect (no wetsuits needed) and there were loads and loads of fish. 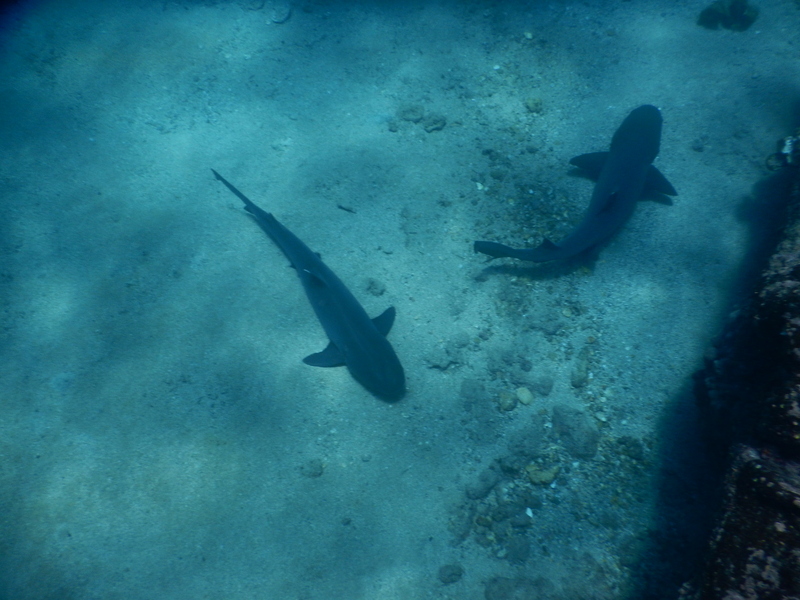 We very quickly found two sharks resting on the sandy bottom and later a stingray also resting along the bottom. 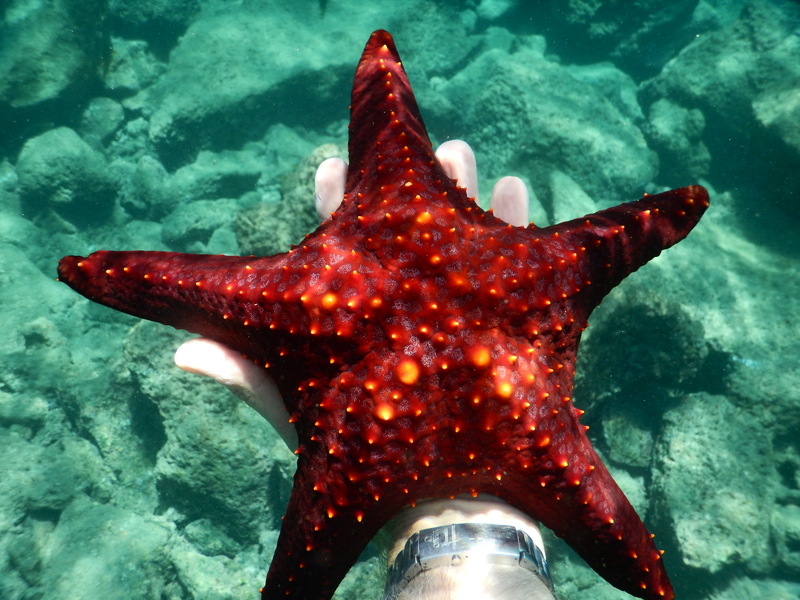 There were starfish of all colors including bright, nearly iridescent blue ones. 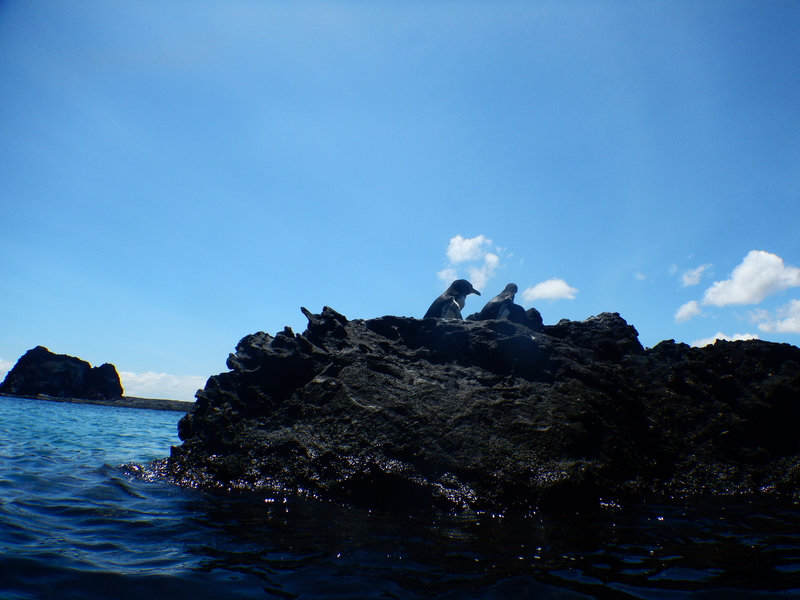 The most exciting experience for me, though, was finding two Galapagos penguins who were initially sitting on a rock and then decided to jump in a join us. 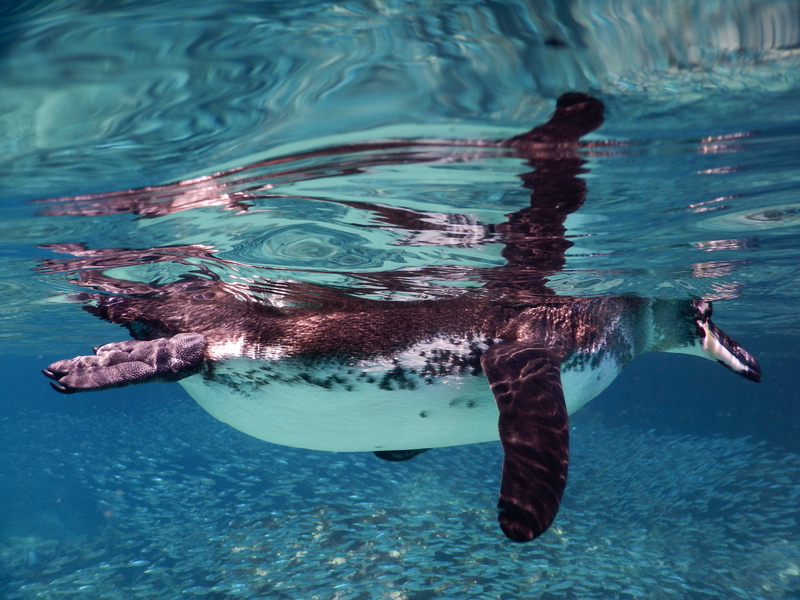 They dropped into the water and swam away, but then came back as if to give us a second look. One of them sat perhaps a foot or two away from my face just checking me out and seemed to be as enthralled with me as I was with it. It was a photo opportunity par excellence, but I couldn’t help just sitting there wondering what he or she was thinking of me and so I took some moments just to soak it all in. 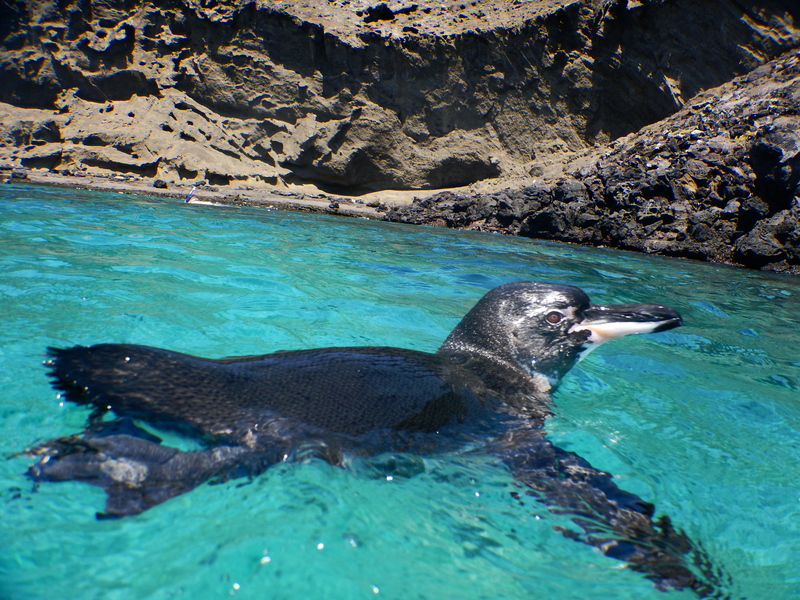 This is the only place in the world that one can snorkel with penguins in the wild and I will remember it always. We snorkeled for perhaps an hour when it was time to get back into the zodiac which had been trailing us and had already picked up everyone other than Kathy, me and Luis. Two others jumped back in to join us at the end of the swim as an early current in the opposite direction had worried them, but we were taking everything in and not even that could force us out of the water. A huge bull sea lion sat floating in front of us along the edge, but had no interest in our presence and decided to remain mostly motionless as it bobbed with the swells. Hoisting up into the zodiac was a real chore and definitely required some serious assistance, at least for me. Our zodiac was larger for sixteen people and, as such, the pontoons were a bit taller than one could navigate on their own. With a count of one, two, three and a very firm hoist from one of the crew I was lifted into the boat and grabbing on to anything to pull myself the rest of the way in. Unfortunately for those already on board, I could also feel my swimsuit riding a bit low on my waist and I am told that my backside below my tan line nearly blinded everyone. So much for a little vanity. 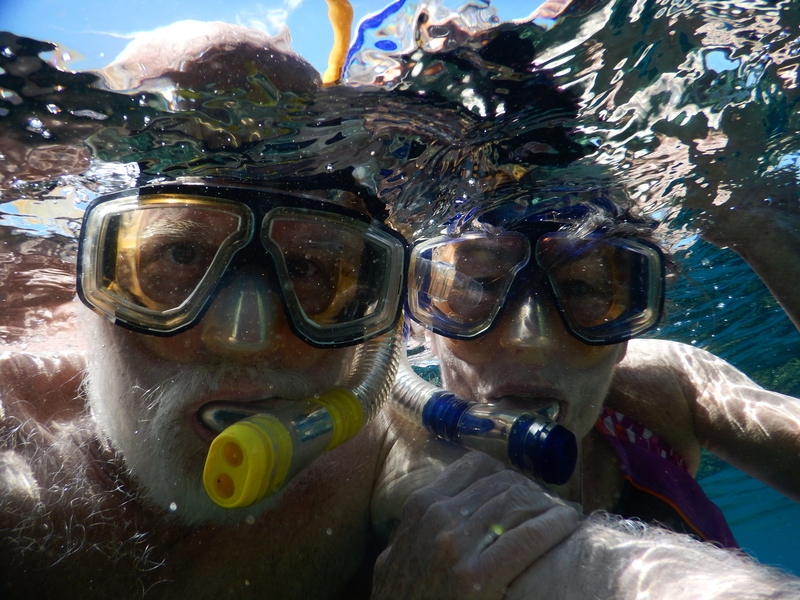 Nothing seemed to matter, though, as this had been perhaps the most perfect hour of snorkeling I’ve every had and I know that Kathy felt the same way. 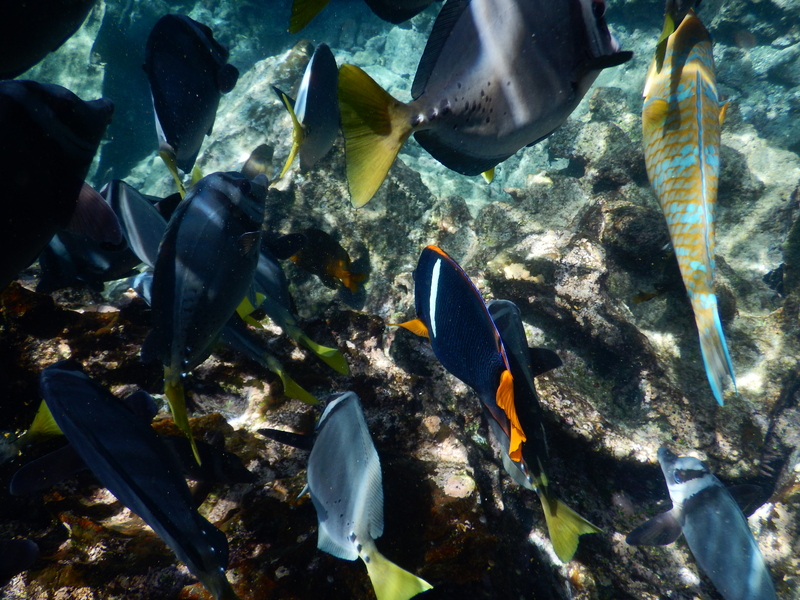 We both could have spent several more hours there as there was an endless amount sea life and something new around every corner. That will have to wait for our next trip. Once back on board, we remained tied to our buoy in the little bay sitting in front of the Pinnacle, relaxing after our swim and preparing for lunch. We all decided to eat outside on the rear deck as there was more than enough room for the eight of us and how could we sit inside and miss these views. Lunch was chicken, rice, salad and vegetables and was delicious. We had cut up cantaloupe for dessert. 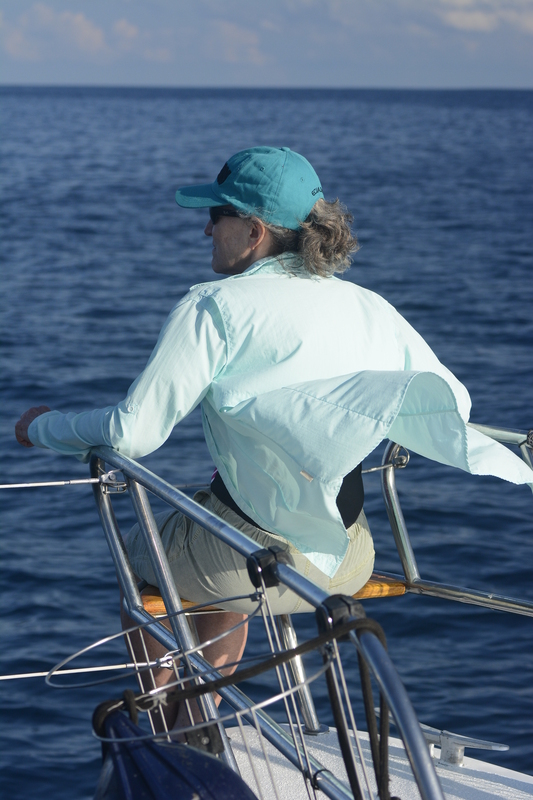 It would be over two hours back to Santa Cruz due to the strong currents in the opposite direction, but that was fine as Kathy and I sat on the foredeck with the wind in our faces. We spent most of the time on the return sitting in the two bow seats as no one else on board was interested and it was a shame for them to go to waste. The wind and the waves were spectacular and the sensation is very difficult to describe. We returned to Itabaca Channel and then to Puerto Ayora after dropping off the pair in Bellavista who we had picked up in the morning. We were dropped off at our house and gave our farewells to the other travelers and to Luis. 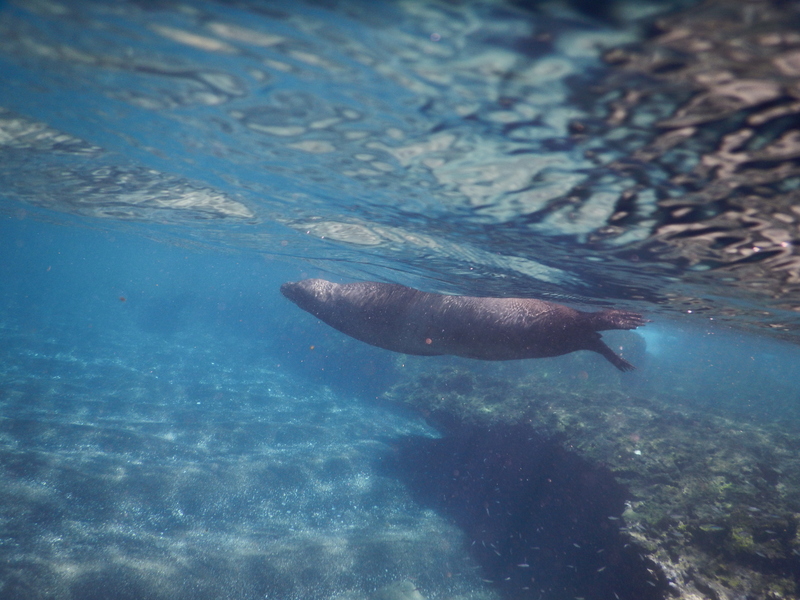 We had had an absolutely perfect day in the Galapagos and wanted to relish in it for as long as possible. We chose to walk around a bit and eventually gravitated back to the kiosks for dinner as we were both relishing another grilled whole fish and, this time, also wanted to get some of the wonderful ceviche here. And, oh yes, we just couldn’t pass up another chance at the grilled corn. Half way through our dinner, two of our boat mates from the day came wandering through after overhearing us describe the food here, so they sat down next to us and also ordered the grilled whole fish. Such is the life in Puerto Ayora, where you bump into everyone at dinner time or during the day as it is such a small place. It is very comfortable and familiar. There was no way we could fit in anything more so ice cream was not in the cards tonight. Marco would be picking us up at 12:30 tomorrow afternoon to go the airport for it would be our last morning here as our vacation was coming to an end. January 28, 2017 – Just a little more time for the sun and good food….